Another couple of ATCs made for Swap-Bot swaps. Very simple themes – yellow, and green. 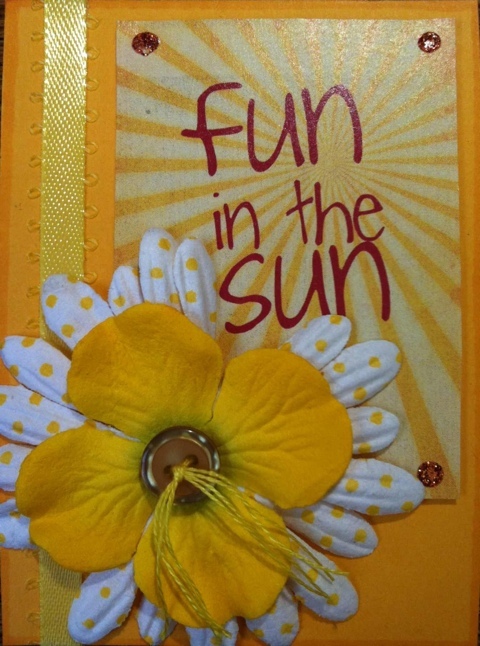 Plain yellow backing paper, with a ‘fun in the sun’ motif cut from some free papers that came with a craft magazine. Yellow ribbon down the side, a couple of paper flowers, with a button in the centre (and some yellow cross-stitch thread too), finished off with some glitter glue spots in the corners of the motif. So summery! Now we just need some summer to go with it! I remember as a kid trying to catch leaves as they fell from trees before they hit the ground. If you managed it you got to make a wish. I never could catch them- they always seemed to veer off to one side just as I was about to grab them. But the sentiment makes for a lovely ATC. I found the ‘wish’ bubble sticker in a box I’d not looked in for ages, and the green skeleton leaf I’ve had for just about forever. I used some backing paper that I received in a swap, and handwrote the sentiment in white pen, outlining it in black to help it stand out more. The colours haven’t come out too well in this photo, but the backing paper is a lot more green than the grey it looks here. 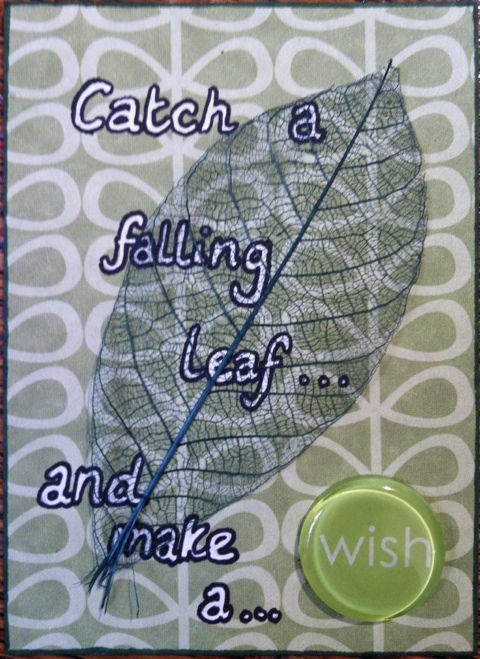 Back in April, I asked my blog readers for some ATC theme challenges. 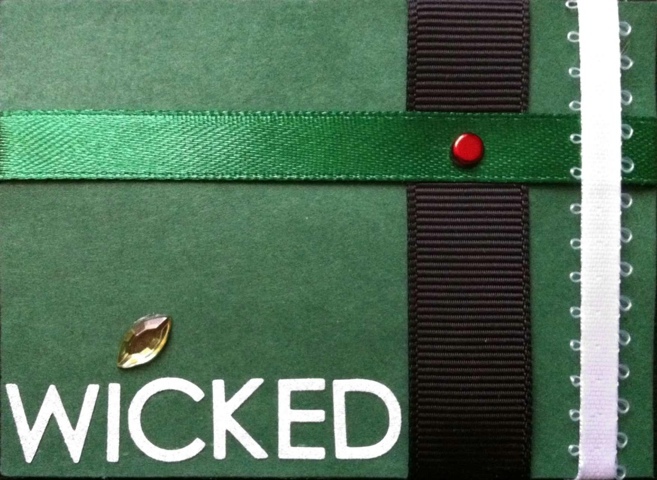 My lovely friend Stacey at It Takes a Woman offered the challenge of an ATC based on the musical Wicked, which is one of her favourites. I’ve not seen the musical (yet! Roll on August! ), so I found this quite a tricky challenge. 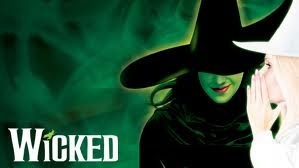 I started by looking up Wicked on Google images. I found a number of poster type images to inspire me, like the one to the left. I spent some time thinking about what to do, as I didn’t want to make a direct copy of the poster. I ended up using… wait for it… yes, you guessed it, ribbon! I wanted to keep the colour theme of the poster, so used white, black and green ribbons, over a green background. A red brad represents the witch’s beautiful red lips, and I have used sparkly white sticky letters (the sparkles don’t show up very well in the photo unfortunately) to write the title. The ATC didn’t really look finished though, so after looking closely at the poster, which has a teeny tiny pale green flying witch above the letter ‘i’, I decided to add a pale green gem embellishment in the same position. I’m a lot happier with the finished product now, and I really hope Stacey likes it!